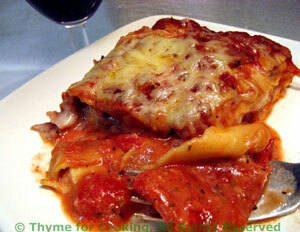 Easy Dinner from Thyme for Cooking: Prosciutto, Pimiento and Chevre Lasagne. Substitute roasted red peppers for the pimiento, if you like. The pimientos I get are whole peppers, not the sliced or diced version. I split them and lay them flat in their 'layer'. Use as many as you like. Leftovers for lunch! This goes together quickly with no-cook lasagne noodles. The Prosciutto (or any dry-cured ham) adds a robust flavor and goes well with the goat cheese but could easily be left out for a vegetarian version. The goat cheese I used was aged, with a thin, white edible rind. The creamy kind would work here as well. Add crushed tomatoes, tomato sauce, herbs and red wine. 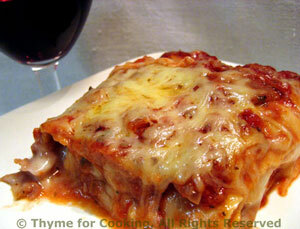 Remove from heat, allow to cool for 2 - 3 minutes then stir in half of the cheese (1/4 cup). Drain peppers and cut in wide strips. Slice the goat cheese thinly, 1/8" (.3cm). Cover and bake 400F (200C) for 20 minutes, or until noodles are done. Test in center with a sharp knife. Uncover and bake 5 minutes longer to brown the cheese.